Rwanda , officially the Republic of Rwanda is a sovereign state in central and east Africa and one of the smallest countries on the African mainland. Located a few degrees south of the Equator, Rwanda is bordered by Uganda, Tanzania, Burundi and the Democratic Republic of the Congo. Rwanda is in the African Great Lakes region and is highly elevated; its geography dominated by mountains in the west and savanna to the east, with numerous lakes throughout the country. The climate is temperate to subtropical, with two rainy seasons and two dry seasons each year. The country's principal language is Kinyarwanda, which is spoken by most Rwandans. The major European languages during the colonial era were German, and then French, which was introduced by Belgium and remained an official and widely spoken language after independence. The influx of former refugees from Uganda and elsewhere during the late 20th century has created a linguistic divide between the English-speaking population and the French-speaking remainder of the country. Kinyarwanda, English and French are all official languages. Kinyarwanda is the language of government and English is the primary educational medium. Swahili, the lingua franca of the African Great Lakes, and the official language of the East African Community, is also spoken by some as a second language, particularly returned refugees from Kenya and Tanzania. In 2015, Swahili was introduced as a mandatory subject in secondary schools. Inhabitants of Rwanda's Nkombo Island speak Amashi, a language closely related to Kinyarwanda. The President of Rwanda is the head of state, and has broad powers including creating policy in conjunction with the Cabinet, exercising the prerogative of mercy, commanding the armed forces, negotiating and ratifying treaties, signing presidential orders, and declaring war or a state of emergency. The President is elected by popular vote every seven years, and appoints the Prime Minister and all other members of Cabinet. The incumbent President is Paul Kagame, who took office upon the resignation of his predecessor, Pasteur Bizimungu, in 2000. Kagame subsequently won elections in 2003 and 2010, although human rights organisations have criticised these elections as being "marked by increasing political repression and a crackdown on free speech". Article 101 of the current constitution limits presidents to two terms in office, but as of 2015 there is a motion underway in the Rwandan parliament to amend this and allow Kagame to run for a third term. The motion, which would require ratification by referendum, was brought following receipt of a petition signed by 3.8 million Rwandans. The main enviromental areas of concern are soil erosion and overgrazing while forested area is under intense pressure from uncontrolled cutting for fuel. During 1981–85, deforestation averaged 3,000 hectares (7,400 acres) per year. Between 1990 and 2000, the average rate of deforestation was 3.9% per year. In 2000, only about 12.4% of the total land area was forested. Malaria and sleeping sickness have spread because forest clearing and irrigation have increased the breeding areas for disease-carrying insects. Rwanda has about 5 cu km of renewable water resources with 94% of annual withdrawals used for farming and 2% used for industrial activity. About 92% of the nation's city dwellers and 69% of the rural population have access to improved water sources. The nation's cities produce about 0.1 million tons of solid waste per year. At 26,338 square kilometres (10,169 sq mi), Rwanda is the world's 149th-largest country, and the fourth smallest on the African mainland after Gambia, Swaziland, and Djibouti. It is comparable in size to Burundi, Haiti and Albania. The entire country is at a high altitude: the lowest point is the Rusizi River at 950 metres (3,117 ft) above sea level. Rwanda is located in Central/Eastern Africa, and is bordered by the Democratic Republic of the Congo to the west, Uganda to the north, Tanzania to the east, and Burundi to the south. It lies a few degrees south of the equator and is landlocked. 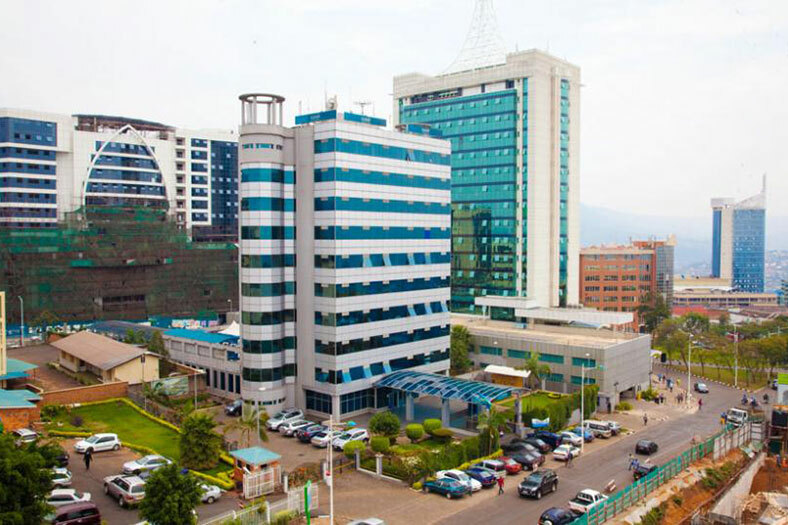 The capital, Kigali, is located near the centre of Rwanda. 11,927,547 people, Rwanda has one of the highest population densities in Africa (1,060/sq mi) with a young, mostly rural population. In 2014, the population is estimated at 12.1 million, an increase from 2013's estimate of 11.8 million. 60 percent of the population lives in poverty. Compulsory education (Ages): 7 to 13 years. Rwanda gained its independence on July 1, 1962. Politics of Rwanda reflects Belgian and German civil law systems and customary law takes place in a framework of a presidential republic, whereby the President of Rwanda is both head of state and head of government, and of a multi-party system. Executive power is exercised by the government.